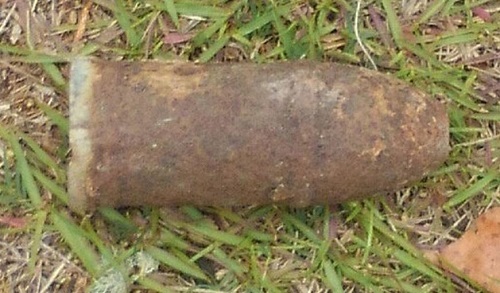 North Myrtle Beach, South Carolina Construction of a patio for a home in North Myrtle Beach was halted when workers unearthed Civil War-era UXO. The city's public safety department secured the area and the Horry County bomb squad was called to the scene. Shaw Air Force Base EOD was brought in to remove the ordnance, identified as a 3" Parrot round. Following removal, the item was safely destroyed at a site west of the Intracoastal Waterway. Co Kildare, Ireland An Army Bomb Disposal Team was called to the scene by police when a Civil War Era munition was found along a local road. Several houses were evacuated and a cordon established as the bomb disposal rendered the ordnance safe. Aragon, Spain Officers of Guardia Civil (Spain's law enforcement agency) uncovered a large cache of Spanish Civil War ordnance in the Jiloca river. Divers spent several weeks removing 538 UXO items from the shallow waters and thick mud of the river. The UXO was safely transported for off-site disposal. 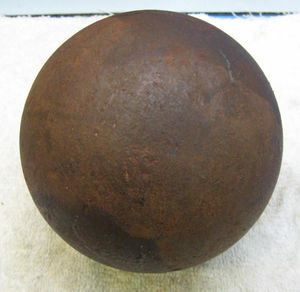 Petersburg, Virginia Police were called to the Siege Museum in Petersburg when a bomb technician determined that three Civil War-era cannonballs being stored in the museum basement were likely live. Though the ordnance was unfuzed, an x-ray revealed that explosives remain in the devices. An EOD team was called in to remove the items from the building. The Deputy Fire Marshal and police secured the area overnight until the team could arrive. The cannonballs have reportedly been in the sub-basement in storage since the late 1970s. Charleston, South Carolina 628th Civil Engineer EOD along with the Charleston Police Department safely recovered a cannonball from a construction site behind the College of Charleston science center. Following an x-ray of the munition, it was unclear whether or not the item still contained black powder, so the decision was made to safely dispose of the item through open detonation. Article copied from the Joint Base Charleston website. Written by Staff Sgt. Andrea Salazar | Joint Base Charleston Public Affairs. The 628th Civil Engineer Squadron (CES) Explosive Ordnance Disposal (EOD) flight detonated explosives brought ashore by the tides of Hurricane Matthew here, Nov. 22, 2016. It is the responsibility of the military to dispose of all military ordnance. 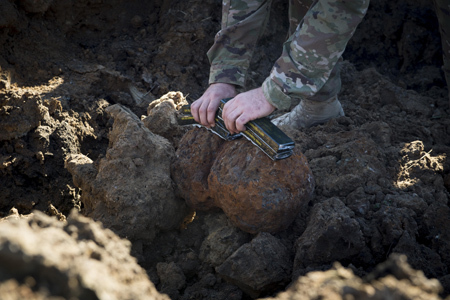 When ordnance are found off base, local bomb squads are usually the ones called to the scene, but once it's determined to be belong to the military, they turn the scene over to 628th CES EOD technicians. "Anything local authorities find that is identified to be military ordnance, they immediately contact us," said Staff Sgt. Mars Hanse, 628th CES EOD craftsman and team chief for the event. "We analyze all explosives with intense safety measures; donning the required protective equipment and accepting the necessary risks when approaching every explosive." Bentonville, Arkansas The owner of a Backstreet Trader, a home furnishing store, called police to report a Civil War cannonball in his showcase. The owner reportedly bought the item at auction over a year ago but became concerned after seeing a news report about a similar find that turned out to be live. You Know the 'Ole College "Keg in the Closet," but This?? Minot, North Dakota A residence hall at Minot State University had to be evacuated when staff members cleaning out a storage closet found a Civil War-era UXO in a box of historical artifacts. The Minot Police Department bomb squad and the Minot Air Force Base EOD Team responded to evacuate the building. The 19th century ammunition was safely removed and disposed.